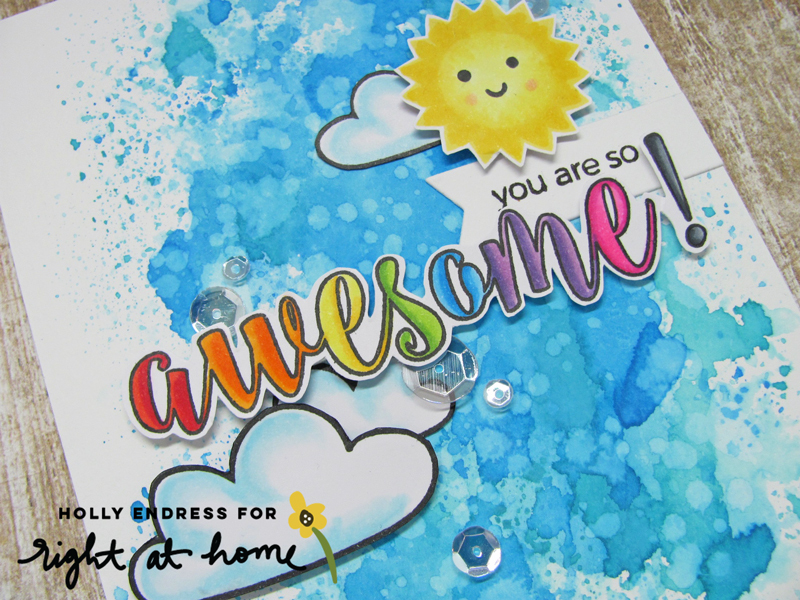 Hollybeary Creations : Autism Blog Hop with Right at Home! Autism Blog Hop with Right at Home! April is World Autism Awareness Month and as a Mother of an Autistic son, I'm proud to be joining in the 2018 Stamping for Autism Awareness Blog Hop sponsored by Veronica Zalis. Nicole from Right at Home and I are joining Veronica and tons of other amazing stampers to help raise Autism awareness! We hope you will help us spread the word and Hop along with us. There's going to be lots of fun prizes too - including a $20 Gift Certificate from Right At Home! I will have Three posts today for the Hop from different companies so be sure to scroll to see them all. To learn more about this hop and see a complete list of sponsors and prizes, please visit this blog post by Veronica Zalis here. I started with a piece of Distress Ink watercolor paper. Then I added some Salty Ocean and Peacock Feathers Distress Oxide Inks to create a watercolor background. I adhered the piece to a top folding A2 size card base and set it aside to dry. I stamped the clouds and sun images from the Banner Alpha Add-On stamp set onto some X-Press It Blending cardstock and added some color with Copic Markers. The sun image was stamped in Lawn Fawn's Sunflower ink and then I added some Copics for additional color. The Sentiment is from the Color In Sentiments Stamp set and I stamped that onto the same cardstock and colored it in with Copics as well. I fussy cut all of the images out (there is a coordinating die available in the shop) and adhered them with some foam adhesive and liquid glue to create my scene. I used the banner form the Folded Gift Tag Die set for the You are so Sentiment. For a pop of Sparkle, I added some Mixed Sparkling Clear Sequins from Pretty Pink Posh. Head over to the Right at Home Blog and Check out what Nicole Created for the Hop. Thanks for joining us for the Special Hop!!! For more information on Autism click here to visit Autism Speaks. What a gorgeous background for your sweet rainbow sentiment! Gorgeous background! And this is totally doable for me, yea! Thank you for sharing and participating in such a tremendous way! LOVE your card ... the background, rainbow sentiment, happy sun. Thanks for supporting the Autism Awareness Day & Blog Hop. Fantastic card! So wonderfully bright and happy. Holly, this is a beautiful card! I really like the "rainbow" colored sentiment. Thank you so much for sharing and for participating in this wonderful blog hop supporting autism awareness. Your background looks awesome! And of course the rainbowy sentiment is just the perfect touch! So sweet Holly. I love how both you and Nicole coloured the word in rainbow colours. This is so sweet. Very nicely done. Love your delightful card! Pretty colors and a great sentiment! Your card is so sweet, It'll lift up anyone's spirits! Such a cute card! It's very happy and uplifting! Love your rainbow sentiment and smiling sun! A Great card to spread a wonderful message of Autism Awareness. Thanks for the inspiration! Cute little sun amongst the clouds. Sweet card! Thanks for supporting Autism awareness! So cute and cheerful!! Love the wonderful background!!! Thanks for supporting this important cause! That’s a great, cheerful card !